Most weeks, New York Magazine writer-at-large Frank Rich speaks with contributor Alex Carp about the biggest stories in politics and culture. This week: Hillary Clinton’s relationship with the media, Bernie Sanders, and the future of the Confederate flag. Hillary Clinton, who has been running a notoriously press-averse campaign, is trying to convince voters that her CNN interview and an intention to take more questions on the campaign trail mark a new direction. Do you believe her? Clinton’s interview on CNN, her first major national sit-down with a journalist since she officially announced her candidacy three months ago, was essentially content-free — but at 19 minutes, easier to take than the similarly anodyne 656 pages of Hard Choices, the memoir that served as her campaign’s soft launch. Yet there were two revealing points along the way. The first was that her claim that her subpar numbers for trustworthiness in recent polls could be attributed to her political antagonists — a “barrage of attacks that are largely fomented by and coming from the right.” That is false. The largest wellspring of mistrust in Hillary Clinton is being generated by such non-right-wing news organizations as the Washington Post and the Times, which have done major journalistic investigations into the financial murk of the Clinton Foundation and will continue to do so. (The Clinton team also blamed the right for vilifying the July 4 rope incident, but again it was the mainstream press that most strenuously called attention to it.) 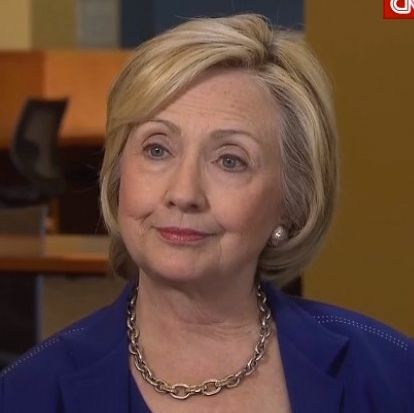 The public’s mistrust of Clinton is further compounded by her failure to answer questions about any controversy in a timely and convincing manner, an evasiveness that surfaced yet again when she batted away foundation questions on CNN. The other interesting aspect of the interview was Clinton’s embrace of Donald Trump as a target, seizing on his bigoted rant about Mexicans and tying it to the entire GOP, including the Establishment figure of Jeb Bush. As I and others have been writing for weeks, Trump is not a joke, even if he plays one on television, but a real threat to Republican chances in 2016. The potential of his off-the-wall diatribes to inflict major damage on the party’s brand at the first Fox News debate, now less than a month away, is real. And increasingly conservative commentators are saying so in ever more panicky terms — George Will, Peter Wehner, Jonah Goldberg. But the fact remains that Hillary is correct: Trump does represent a major strain in his party. His enablers include not just the old Sarah Palin base, but major, non-fringe figures. Chris Christie, Ted Cruz, William Kristol, Rudy Giuliani, Rush Limbaugh, and National Review’s Rich Lowry have all defended Trump to various degrees. Others are cowering and saying nothing, much as they did in the Confederate-flag debate immediately after the Charleston massacre. It took Jeb Bush more than two weeks to disown Trump’s incendiary sentiments about Mexicans. Which is to say, Hillary Clinton can dodge the press as much as she wants as long as this is the opposing field. No Republican is going to win the presidency if a mobilized American Hispanic population turns up to vote for a Democratic ticket in the same lopsided numbers that African-American voters do. Bernie Sanders’s rallies in Iowa and Wisconsin have started to attract as many as 10,000 people, and essentially all of the $15 million raised by his campaign comes from small donations ($250 or less). Clinton advisors are worried. Is Sanders’s momentum a measure of something he’s doing right, or something Clinton’s doing wrong? As everyone knows, Sanders speaks with passion and authority about the key issue of economic inequality, and Clinton does not. I don’t believe her advisors are truly worried, and I see no reason why they should be. Sanders can certainly bloody her in some early primary contests, and possibly in debates where he will (rightly) challenge Clinton’s latent populism. And if he’s sharp enough — and brave enough, really — to go at it with her face-to-face, it can only make her a better candidate for the general election. But let’s get real here. Sanders does have large, enthusiastic crowds but most of them are in venues (Madison, Wisconsin; Portland, Maine) that are essentially all white and have no real consequence in the race for delegates. Indeed, Sanders has no known African-American or Hispanic support — essentials if you are running for president as a Democrat. If elected, he would be the first Jewish president (already Politico has cited his youthful stint on an Israeli kibbutz as an example of his socialism) and the oldest to take office. (He will be 75 on Election Day; Ronald Reagan was 69; Joe Biden will be 73.) He does not have big money or big organization. And any comparisons to Gene McCarthy’s insurgency are simplistic. In the apocalyptic year of 1968, McCarthy (and Robert Kennedy behind him) were challenging a hugely unpopular incumbent president presiding over the most disastrous war in American history up to that time. The truth, though, is the Democrats still need a Plan B should Clinton falter for any reason, from unexpected illness to an as-yet unknown scandal. And the Democrats, unlike the Republicans, have a very small bench of presidential prospects. But even under the circumstances of a Clinton collapse, it’s hard to imagine the Democratic political Establishment and economic backers turning to a white Vermont populist/socialist, no matter how many college students cheer him on. Hard to imagine them turning to the lackluster Martin O’Malley either. Which leaves — who? If there’s a plausible Clinton understudy acceptable to Democratic powers-that-be other than Joe Biden, I don’t know who it is. As the South Carolina legislature votes to relegate its Confederate flag to a museum, museums in Virginia are debating whether to display the flag outside of their basements, and others are arguing that isn’t far enough: TV Land has decided to pull reruns of The Dukes of Hazzard off the air. Are we in the midst of a politically correct over-correction? Of course. It’s an easy call that the flag should not be flown at any public institution, and it is still astounding that it took the murder of nine people 150 years after Appomattox for the neo-Confederates in the south to finally figure it out. But the end result of banning the flag everywhere will be to further bowdlerize some of America’s most savage history, much of it still vague to far too many Americans. Let new generations see Gone With the Wind and Birth of a Nation and all other fictional glorifications of the flag and what it represented so they can ask questions and learn how much our culture (and politicians) succeeded in denying the horrors of slavery and racism for so long. The flag is an egregious symbol, but we should be worrying most about the substantive remnants of racism and Jim Crow that it stands for — from economic, governmental, and policing inequities to the current Supreme Court’s disemboweling of the Voting Rights Act. And we should step up our efforts to stop falsifications of the real story of our past. As recently as 2010, the then-popular Republican governor of Virginia, Bob McDonnell, issued a Confederate History Month proclamation that made no mention of slavery, and few in his party criticized him for it. This week the Washington Post reported that public-school students in Texas this fall will be reading state-mandated textbooks that list slavery as the third cause of the Civil War behind “sectarianism” and “states’ rights.” Incredible as it sounds, Texas’s American history guidelines don’t even mention Jim Crow laws or the Ku Klux Klan. Surely this outrage, and there are plenty others like it, is far more worthy of action than the appearance of a Confederate flag on a basic-cable rerun of a three-decade-old antique like The Dukes of Hazzard.